Lately, God has been busy doing so much work in my heart. On the outside, my external circumstances don't look much different. On the inside, God has given me fresh vision and fresh perspective. My joy, faith and expectancy levels are on the rise and growing by the day. God has brought about a restoration of hope in my life. Hope is crucial for us as lovers of Jesus. 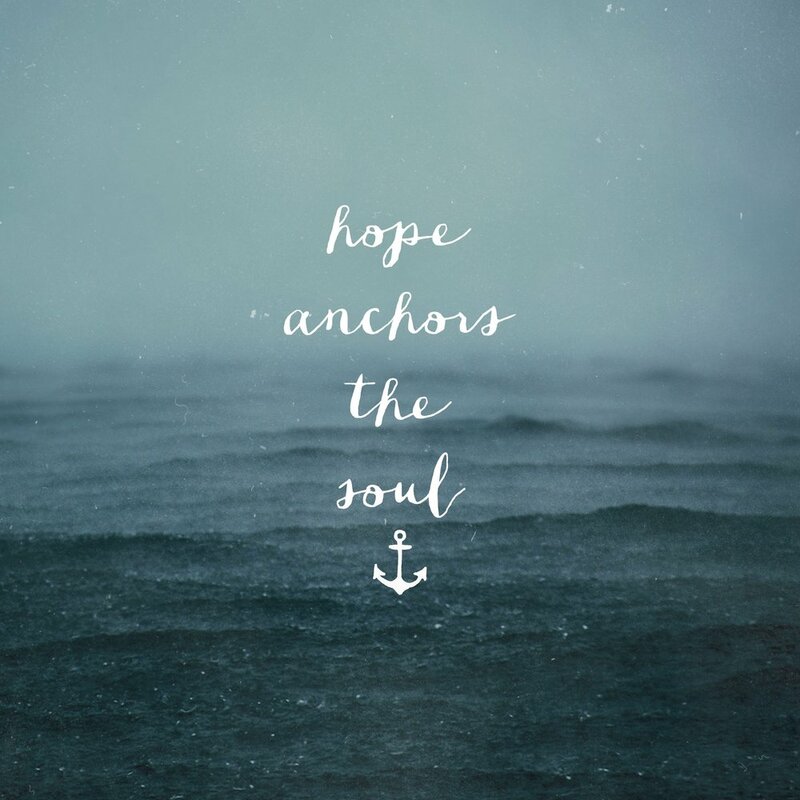 Hebrews 6:19 tells us, "[Now] we have this [hope] as a sure and steadfast anchor of the soul [it cannot slip and it cannot break down under whoever steps out upon it-a hope] that reaches farther and enters into [the very certainty of the Presence] within the veil (AMP)." Recently, I was listening to a sermon by TD Jakes, who I can't get enough of these days. He had this to say about hope, "Hope is an expected end. It's not a specific process." That one simple statement jumped out at me and really caused some things to come into focus in my life. Finally, it clicked. There is so much that happens in "the process" that at times it can be very difficult to hold on to hope. It never seems like the process has anything to do with the destination or our end goal. Things never go according to plan (or should I say our plans) and it often seems like we are heading in the opposite direction of our dreams. Doors close. Things fall through and sometimes seem to fall apart. Seasons come and go. When things don't go as expected, we tend to fall into a place of discouragement and we start to think that maybe the promises and the dreams that we are after aren't really going to happen after all. We think that maybe we didn't hear God right. We think that maybe it would be safer, wiser even, to downgrade our dreams to shield ourselves from the risk of disappointment. I have definitely been there before. Recently, God has been showing me areas of my life where I have stopped dreaming. He has showed me places in my heart where, without realizing it, I had given up on hope and bought the lie that the way things are is the way things will always be. God presented me with an invitation to pray risky prayers and dream big dreams again. And I accepted. Once I realized that my hope is in who God is, who He has called me to be and what He has purposed for my life, I became liberated to dream with God once more. We forget sometimes that we already know how this story ends. God will have His way in our lives. He is faithful to complete the work He has begun in us. He will accomplish His purposes and the promises He has spoken about us will come to pass. The process that we need to go through and the journey we have to take to get us there can be challenging for sure. There will be bumps, delays and detours along the path, but when we go with God, nothing can stop us from reaching His destination in His timing. Nothing can rob from us this hope that we have and get to hold unto. All the things that come up on a daily basis and that attempt to discourage us are merely details. We can't get so hung up on the details, or the specfics of the process, that we lose sight of hope altogether. We have to face the fact that God's process never looks anything like we expected it to, but it always leads us to exactly where we need to be. There is so much freedom that comes with choosing to set our focus on what God has said rather than what we can see. A weight is lifted off of us when we choose not to overthink the details and trust God with the outcomes. It takes the pressure off of the current moment by eliminating the idea that in order to see the fulfillment of our dreams, things must look as we expected them to. Hope says that even when things don't look like I expected them to, God is trustworthy. Going forward, I am choosing to take my eyes off the specifics of the process, in order to set my gaze on the expected end. Each day I am asking God to help me to have eyes, mind and heart fixated on hope. As Paul writes in Col. 3:1-2, "Since you have been raised to new life with Christ, set your sights on the realities of heaven, where Christ sits in the place of honor at God's right hand. Think about the things of heaven, not the things of earth." I was driving home from a friend's house last night and Josh Groban belted it out through my radio. I heard the following words and knew God was speaking directly to my heart: "Don't give up. Because you are loved." Just knowing that the Father loves me gives me a reason to keep going every day and to never lose heart. Being loved changes everything. Where love is, hope is also.